[New for 2014] Of the four new flavors of Talenti, I think this one excited me most, maybe since I missed trying their White Chocolate Raspberry flavor. Sorry for the tease, but I had to do it. 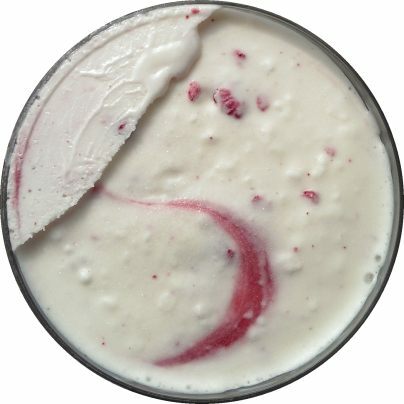 See, I popped open the pint, and doesn't that smooth white texture look strangely familiar? Kind of like something you might on part of your breakfast? I decided to take a big whiff and... I smelled cream cheese! That's right, the gelato is cream cheese flavored! How's that for unexpected? Is it good? Ofcourse it is! There's no denying the cream cheese flavor, and I don't mean cheesecake here, I mean literal cream cheese. 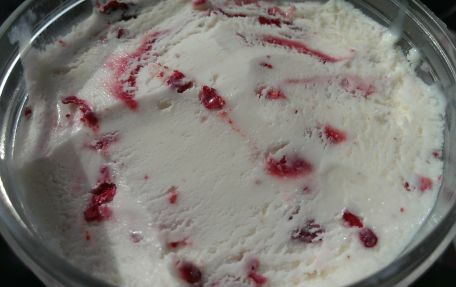 Now just look at the prolific swirl and raspberry bits! The raspberry tartness is fairly minimal, and I'm not getting that woodsy flavoring that I got from their black raspberry chip gelato. No no no. This one is trying to be a raspberry danish and doing a great job of it. If you hate cream cheese, obviously you'll want to avoid this one. Me? Well, while my wife and daughter love bagels and cream cheese, but warm cream cheese has never been my thing. Instead, I like it cold! I usually sneak some cold Philly cream cheese on some Ritz crackers if I get a chance. So, turn that pleasant cold cream cheese flavor I like in to a nice, mild cream cheese flavored gelato, and you've got a winner. I think this might be the flavor that finally makes my wife a Talenti die hard fan like me. The more I eat, the more I want. I wasn't sure how I much I wanted to eat at first, but it's got me hooked after a few bites. The flavor balance between the raspberries and cream is really working well. Oh my word do I want to eat this entire pint.... The start of the week is always tough and I just want to spend the next 15-20 minutes making this new gelato disappear. I'm using every bit of self control to not inhale the rest of this. Nice job talenti, the world of cream cheese lovers is yours for the taking with this one. On Second Scoop: [note: I wrote this before getting the official flavor description] Hahaha, I was going to say that I got a hint of balsamic vinegar... and sure enough, it's in the ingredient list! I'm getting pretty good at this ice cream review thing. I know this will never be part of my go-to flavor pack, but there's no denying the quality or originality of this flavor. I love that talenti is putting themselves out there like this. Fancy, not but too crazy. Something new and unique but not scary. Wait, one more point. As colorful as all these photos have been, I could actually use a bit more raspberry flavor. 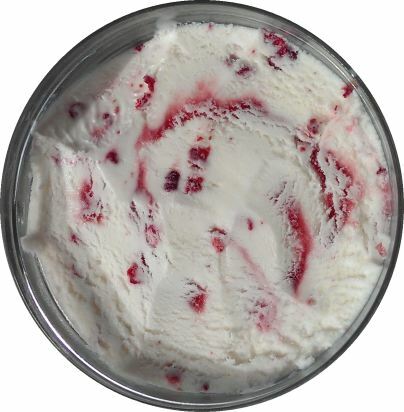 It's a mild cream cheese flavor with an even milder raspberry flavor to go with it. However, it's still really cool and I am truly impressed with how that cream cheese flavor comes across. I hope they experiment more with it in the future. Man, I am really hating you guys for finding all these new Talenti flavors (Apple, Brownie, R & C), I've not seen any of these in stores around here. Then again, it is my birthday today, and I do happen to have 8 (Eight) pints in the freezer right now. I wonder why Talenti doesn't list cream cheese as an ingredient? As someone who dislikes cream cheese, I like to have fair warning! I've never had Talenti's before, but after reading this review I decided to purchase this flavor. Haven't tried it yet, but I think I may do a video review. Can't wait to try this one! 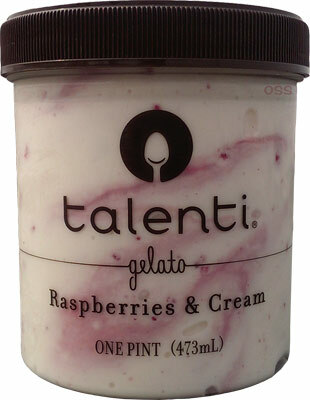 I am really getting into Talenti lately. @ Sascha, Happy belated birthday! I am seriously jealous of your Talenti stash! I'm new to Talenti, and I am sooo excited about the deliciousness I'm in for! 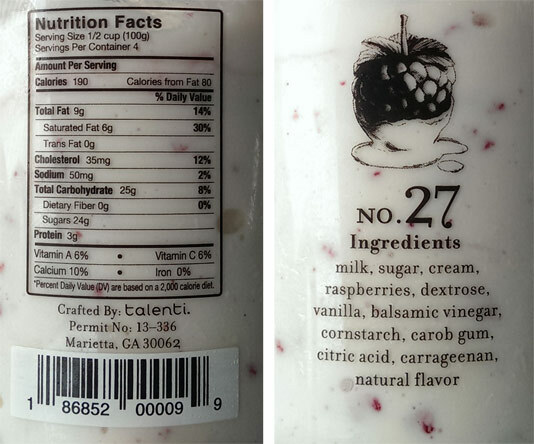 I love the taste of the Raspberries & Cream, but was wondering if anyone else is having a problem with the texture? I love the balsamic, but it's hard for me to get past the crunch of all the raspberry seeds! There are so many my teeth don't come together when I'm eating it! I guess it's the price you have to pay for fresh raspberries, but honestly, they should list them as their own ingredient because they were a huge part of my experience with this flavor.